A Local Road Safety Plan (LRSP) provides a framework for organizing stakeholders to identify, analyze, and prioritize roadway safety improvements on local and rural roads. The process of developing an LRSP can be tailored to local protocols, needs, and issues. However, safety projects stemming from the plan need to be consistent with Federal and State project funding requirements if those funds will be used for project implementation. Also, the plan should be viewed as a living document that can be continually reviewed and updated to reflect changing local needs and priorities. The HSIP is a Federal-aid program that incorporates a data-driven, strategic approach to improving highway safety that focuses on performance. This program supports highway safety improvement projects that are consistent with the data-driven SHSP and is designed to improve the safety of a road location or feature or to address a highway safety issue; that is, the SHSP provides a strategic direction for a State's safety investment decisions, and the HSIP supports and finances projects specifically targeting roadway and intersection locations by identifying and implementing countermeasures to improve the safety of the site. While the SHSP is used as a statewide approach for improving roadway safety, an LRSP can be a means for providing local and rural road owners with an opportunity to address unique highway safety needs in their jurisdictions while contributing to the success of the SHSP. The process of preparing an LRSP creates a framework to systematically identify and analyze safety problems and recommend safety improvements. Preparing an LRSP facilitates the development of local agency partnerships and collaboration, resulting in a prioritized list of improvements and actions that can demonstrate a defined need and contribute to the statewide plan. The LRSP offers a proactive approach to addressing safety needs and demonstrates agency responsiveness to safety challenges. What is the purpose or goal? Which agencies are critical to include during plan development? How will safety problems be identified? How will improvement strategies be identified? Prioritized? Implemented? How will the plan be monitored and updated? Establish a working group. A wide range of stakeholders from the "4E's" of highway safety should be encouraged to participate in developing an LRSP. The 4E's refers to the engineering, law enforcement, education, and emergency response communities. Stakeholders can also include those with a passion for roadway safety such as parents and civic groups. Local agencies have seen success by designating a safety champion to lead development efforts and identifying a dedicated group of stakeholders to assist in managing the entire process across departments and agencies. This process normally includes planning, implementing, evaluating, and updating. Review crash, traffic, and roadway data. Stakeholders need to identify and compile relevant safety data to organize the information into categories that highlight an area of concern. These categories could be roadway characteristics, such as horizontal curves; vulnerable users, such as pedestrians; special vehicles, such as bicycles or school buses; or specific crash types, such as head-on crashes. Among the sources of data to include are local law enforcement records, State and local crash databases, local road traffic volumes, and roadway infrastructure records, if available. If data is not readily available, then safety data may become an area of concern of the LRSP, and objectives may include improving data collection. 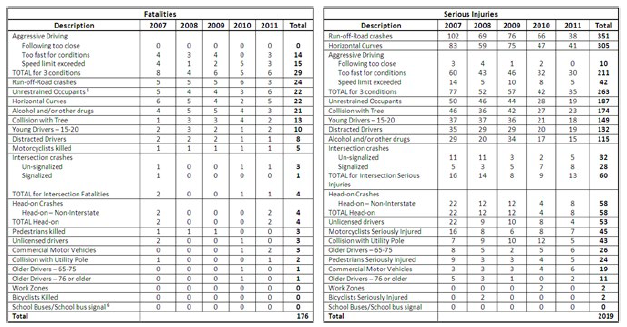 The next step in developing the LRSP should be to select the areas of most concern related to causes of fatal and serious injury crash types on local roads for at least a 5-year period, similar to the example shown in the table below. The plan can also identify trends related to shifts in crash types (e.g., distracted driving crashes on the rise) and contributing factors. Establish goals, priorities, and countermeasures. Stakeholders need to define priorities and identify a safety goal (e.g., reduce 1 fatality and 10 serious injuries per year), identify countermeasures that correlate to each emphasis area, and include costs, benefits, and deployment levels for each countermeasure such that the safety goal is satisfied. Once stakeholders have agreed on safety countermeasures, the plan can isolate and recommend improvements at identified crash locations, corridors, intersections, etc. The plan should include an approach that may be considered spot, systemic, or comprehensive in nature. Spot countermeasures are applied at specific locations or roadway segments. An example of this would be reconstructing the 10 curves with the highest number of crashes. Systemic countermeasures are usually low-cost and deployed in a widespread manner. An example would be adding advisory speed plaques to all curves in a region. Comprehensive countermeasures can include a spot or systemic countermeasure with the addition of outreach and enforcement. An example would be a coordinated speed enforcement program with an accompanying outreach initiative. Implementation and Assessment of the plan. Overall, the LRSP should summarize the needs identified, the safety goal, emphasis areas, and a prioritized list of improvements or activities. Additionally, the plan can identify responsibilities and resources to carry out the plan. Items that may also be documented include the stakeholders and process used to develop the plan, successes realized through similar past or current efforts, and obstacles or challenges related to implementation. The working group should monitor the plan to evaluate effectiveness and relevance over time and should adjust the plan periodically or as needed. The LRSP should include information on this evaluation. Determined short-, mid-, and long-term actions within each of the 4E's. The process Clackamas County used to develop its County TSAP closely paralleled the process used to prepare Oregon's TSAP and was in accordance with requirements for HSIP funding. The county plans to use the TSAP to guide future projects and efforts to achieve their safety goal.